The brilliance of the art of the APY (Anangu Pitjanjatjara Yankunyjatjara) Lands has been obvious to people like me lucky enough to travel widely through the Aboriginal art world since at least 2000. So it came as a surprise to realise that the survey involving more than a hundred artists from the seven tiny communities that dot the deserts across the north of South Australia is the first that Sydney has ever had the chance to see. And as I'm writing towards the end of its stay at the dynamic little Hazelhurst Gallery in Gymea, you'd better leap on a train to Gymea and make the 400 metre walk into the Gallery as soon as possible - before 11th December. On your way in, you'll be greeted by “the matriarchs and patriarchs” of the communities in the words of photographer Robert Fielding, who has captured some of the serious joy that goes with reflecting their culture on canvas in the faces of these mostly elderly artists. Mostly elderly – but the sad fact to emerge from talking to curator Carrie Kibbler at the Gallery is that the honorific 'Kunmanara' is attached to far too many of these wonderful people's names – reflecting their demise. Two have actually died since the exhibition's opening on 15 October, and seven others amongst Ngananampa Kililpil – that's Our Stars in Pitjanjatjara, reflecting the ownership of the exhibition by the communities – have also 'shot through'....shooting stars in the best possible sense. The death of Kunmanara (Gordon) Ingkatji during the year-long development phase of the show was a knife-edge time, for he was such a revered figure that the Sorry Business that would follow might have halted the whole project. But, in fact, it acted as an inspiration to the 22 senior male artists who so admired this fellow-artist, em>nintilpai/teacher, choirmaster and Honorary Fellow of Adelaide University who also initiated the Kulata Tjuta project of spear-making across the Lands as a way to bring their young men into the culture. This had been received as art as well as culture and taken south to Adelaide twice – an installation at a Biennial and an installation and an inma/performance at last year's Tarnanthi. As a result, in the collaborative painting made in tribute to Ingkatji there are many spears – but the seven laying horizontal are the ones that represent the seven who have passed. Ceremonially, in front of the giant painting are seven actual, named spears from master maker, Sammy Dodd. The women, as ever these days, are competitive. Their collaborative is equally large, involved more artists – 24 – and, unlike the men, was achieved by getting together communally to capture their 'Seven Sisters Dreaming'. The men's canvas had to move from community to community. Perhaps this is the only way that young Vincent Namatjira at Iwantja could sneak in a self-portrait that challenges the harmony of the whole! And perhaps the women had a whole lot more planning to do as they envisaged something that large and that complex, balanced out artistic egos and made sure that their story did actually have the requisite seven stars! The result should surely 'star' in the National Museum's planned exhibition on the Seven Sisters Songline – but was actually made purely for the Hazelhurst display. And the joy of the experience is happily captured by a photo on the cover of the Gallery's exhibition brochure as artist Nyukana Norris throws her arms wide in front of the canvas. Her own canvas – 'My Country' is also a stand-out, creating deep abstraction as she reflects on the bush foods available in such an unpromising-looking environment. Norris's work makes one realise that although there might be an impression of great homogeneity of painting across the Lands, there's actually much variety despite a fairly universal use of wilder colours than other Aboriginal art areas. While the men may start from the idea that red is their colour based on their ceremonial association with blood – and one can only stand in wonder before the exhibition's Keith Stevens canvas at the intensity and variety of his red-only work – even a traditionalist like Hector Burton can pack a paintbox full of colours into his predominantly red 'Punu Ngura' painting; “From the Trees” being a series of works that were intended by the old men at Amata to protect the essence of their culture by not revealing it through too obvious story-telling. Other absolute individuals include Mumu Mike Williams, as political as any urban painter; Alec Baker, working assiduously in ink; Tali Tali Pompey evoking the ghostly trunks of desert gums in a series of vertically varied brush-strokes against desert dotting; the increasing mastery of the potted form by Derek Jungarrayi Thompson; and Vincent Namatjira's idiosyncratic 'Cook's Story' that's more Outsider art than desert. 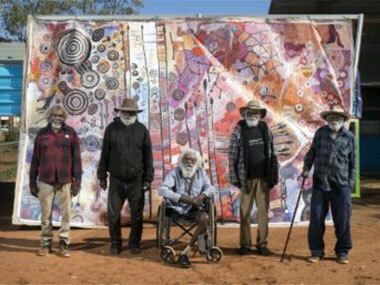 Namatjira and Robert Fielding are the two youthful outsiders in this patriarchal/matriarchal world – Fielding having blown-up versions of his 'Milkali Kutju/One Blood' photographic work which announced his arrival on the scene at the 2015 Telstra Awards out in the Gallery's park as a mural. But their presence raises questions about the absence of two other prominent and highly individualist APY artists – Tiger Yaltangi and Yaritji Young. It would seem that much of the selection was made in the Lands by Skye O'Meara, a former art coordinator, now running the APY Arts Centre Hub. This newish body seems to be operating in parallel with the long-established Anangku Arts, and one wonders whether two such bodies are really necessary. However, it's clear that this show really needed to be done at this time while some artists cling to life and others are still warm in the memory. It's a reminder that there was such pent-up desire to paint over the 50 years since the Ernabella art centre was established during which a variety of limitations had been imposed on potential artists to make only craft work. Hopefully, it's happening will inspire the next generation to explode just as fruitfully. And certainly the unlikely setting in Gymea – deep in Sydney's southern Shire – is more than justified by the enthusiastic buzz that's always around that gallery (and its excellent cafe), by visitors from all over Oz, not to mention New York and Nepal, and by active social media. If you're not in Sydney, an excellent website (below) makes up for the absence of a physical catalogue. Maybe it corrects the error in the brochure regarding the Ngintaka Tjukurpa, the Perentie Dreaming, which suggests that the Perentie is hunting a stolen grinding stone, when he'd actually stolen it himself. 'Kungkarangkalpa/Seven Sisters Dreaming', the APY Women's collaborative canvas at Hazelhurst Gallery, framed by 'Two Trees', a work by a group of Tjanpi Weavers.